Geoff Hansplant is a Piedmont style country blues guitarist with a philosopher's touch. His music blends groove driven flashy acoustic blues guitar with carefully crafted lyrics which express that which is universal to the human experience through that which is part of the personal journey of life. This is a thinking man's blues guitarist. A year and a half after its initial release, Pilgrim's Progress by Geoff Hansplant has been completely remixed and remastered following a re-recording of all the vocal tracks. The result is a crisper, livelier recording which you are sure to like. The driving grooves and infectious melodic lines are still there, but richer and better defined than in the original release. Give it a listen and try to get the tunes out of your head and out of your feet! 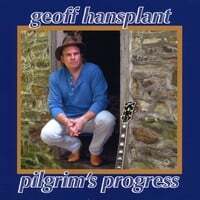 Talented artist, Geoff Hansplant, and his wonderful Folk album, “Pilgrim’s Progress,” will take you on an interesting musical journey of life’s trials and tribulations. His moving lyrics reflect life’s ups and downs, dreams we may have, and regrets we may have done. The upbeat and catchy songs, “Zoe’s Cakewalk” and “Black Dog Boogie,” are instrumentals featuring some excellent guitar playing that flows with a nice polished technique. The title track, “Pilgrim’s Progress,” is an easy moving song with Hansplant confidently singing the melodic lyrics. You’ll like the rousing song, “End of the Line,” as it has a nice slide guitar effect and a subtle flavoring of Country flair. Fans of Folk music will find the delightful songs on the album, “Pilgrim’s Progress,” to be novel and a refreshing collection of music that is genuine about its roots and sound. Hello all, I'm Geoff Hansplant and I am perhaps the least qualified person on the planet to tell you who I am. Musically, I'm something of a contradiction in terms. I play Piedmont style country blues guitar in the tradition of Blind Blake and Rev. Gary Davis, but write contemporary lyrics exploring many aspects of the human condition. My influences run the gamut from the old blues masters through Gershwin and Carmichael, to the Beatles, Richard Thompson, Justin Hayward and Chris Smither. I believe that the words and music each complement and define the other. I sweat the details. I believe that if you have something to say, say that thing and not something in the general vicinity of it. At the same time, I live for the artistry of the song; that quality of the turn of phrase or the musical hook which can momentarily transport us to another place, time or understanding. My songs try to express that which is universal in the human condition through the glass of personal experience. The songs here are from my 2009 album, Pilgrim's Progress, a collection of original material linked by the common theme of the journey of life in its many guises. I hope you like them. I hope they make you stamp your feet and laugh out loud. I hope they make you think of your own place in this world and bind themselves to elements of your own life so that you cart them around with you on your own journey. I hope they become your companions. Maybe then you'll know who I am.